As I wrote in my post, Why I Want to Give My Children a Charlotte Mason Education, we use narration in our homeschool. Narration simply means retelling what has just been read; it takes the place of worksheets and quizzes, and it lays an excellent foundation for formal composition. I remember the first time I stumbled across Ambleside Online, the Charlotte Mason web-site we base our homeschool curriculum on. It was late at night, I had a baby in my arms, and an unsettled feeling about our newly started school year bumbling about inside me. I followed a link from an article about the Charlotte Mason Method in The Old Schoolhouse Magazine newsletter I was reading. What I found intrigued me. I had heard about the CM method before, and was using a curriculum that incorporated some of those methods, but what I read on Ambleside’s web-site was quite a bit different from any curriculum I’d seen before. The curriculum plan I saw laid out before me was basically this: have your kids read ‘real’ books, and then have them narrate (tell back) what they read. “Could it really be that simple?” I wondered. Something about that simplicity beckoned to me, and I decided to give it a try. 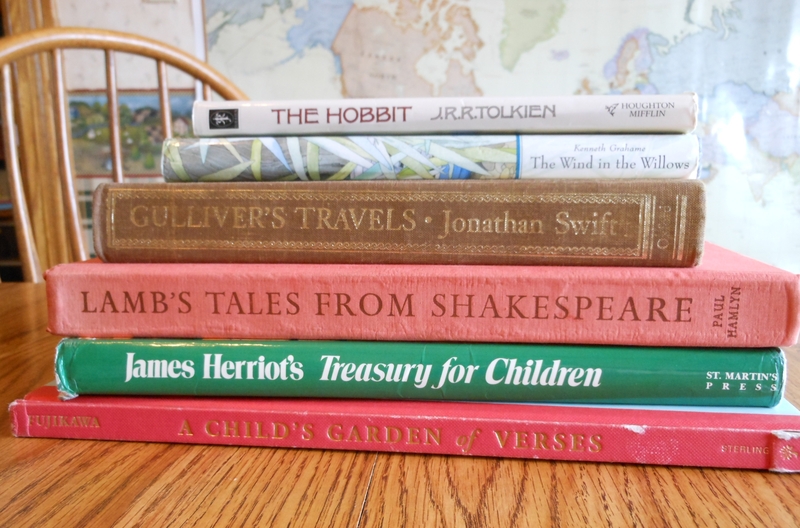 We kept the math curriculum we began that year with, but other than that, we revamped our entire curriculum to include things like: living books, narration, copywork, dictation, Shakespeare, picture study, composer study, and nature study. We found resources for most of these new areas of study for free online. I found myself loving it! I loved the pace, the quality of literature, the way this kind of learning fostered my kids’ natural curiosity about life. And now, nearly three years later, I can say with confidence that my kids have learned so much simply by reading great books and narrating them. I’ll bet if you’re like I was at first, you’re thinking this narration piece sounds too easy, like a walk in the park, like avoiding what takes effort. But I’ve found that although narration is a simple idea, it isn’t necessarily easy. I’ve tried taking the kids’ turn when it’s time to narrate, and it actually takes a good amount of effort to think back over what has just been read, remember it, decide what’s important, what came first, what happened next, etc. It’s especially difficult to make it flow in a coherent fashion without a lot of “ums,” “and thens, ” and “no, waits”! When the kids are narrating, one very important thing for me as the listener to remember is to not interrupt, question, or correct them until they are finished with all they want to say. It’s only after they are through that we discuss the reading and correct any errors or misconceptions they have. The reason for this is that it’s crucial for them to learn how to express their thoughts freely, and it is very difficult to do that if they are constantly being interrupted with questions and corrections. At the end of each 12 week term, we have “exams”. The kids narrate to me what they remember from each book we read during that term. They dictate to me what they want to say, and I type it up and print it out for them (my oldest daughter types her own). I’m always astounded at how much they can remember without reviewing, or studying, or in any way preparing for these exams. They like to see who can fill the most pages! 🙂 This assures me that they are retaining what they read. Narration doesn’t always have to be a retelling of the reading from beginning to end, however, so in order to break the monotony of retelling each reading, we do what I’ve seen recommended on several CM websites. The kids shake things up (literally!) from time to time by rolling dice to determine what kind of narration they will give. They do the thing on the list that corresponds with the number that’s on the dice. 5. Ask me five questions about what you read. 7. Draw a picture of what you read. 8. Tell me 3 – 5 things about what you read. 10. Make a model of something from the story using Play-Doh. 11. Set up a scene from the story using blocks, Legos, etc. 12. Act out a short skit from the story. Narration is on the list more than once, because a straight retelling of a reading is the most focused form of narration, and requires a higher level of mental effort — which is a good thing! Of course the kids have their favorites. My 7yo and 9yo especially enjoy modeling something from Play-Doh, or setting up a scene with their blocks (or skipping the narration!). My 10yo and 12yo more often than not choose to just give a narration rather than rolling the dice. I sometimes ask them to tell me their favorite part, or make this one just a brief summary, or describe just one event in detail. The younger kids narrate orally, and the older kids gradually transition to writing one narration a day while continuing to narrate orally. Every reading from each subject is narrated. As my oldest approaches 8th grade and then high school, she’ll begin using a writing handbook to learn formal composition, creative writing, research papers, essays, etc. Charlotte Mason Help has a terrific guide to narration and composition in the upper grades, and I know I’ll be relying on that a lot for help with teaching these things. Also, Ambleside Online has a Language Arts scope and sequence which is really helpful . If you find yourself being intrigued with the idea of using narration in your homeschool, I’d encourage you to give it a try. Maybe you could replace a few worksheets or projects here and there, asking your kids instead just to tell you what they remember from their reading. Since we’re so close to the end of this school year, changing things up a bit might just help to push you to the finish line. I ordered the Andreola book from which your quote came just a few days ago. Someone else suggested it, and I thought it might be a good summer read! I am in the “first year boat” now and sometimes have the “unsettled feeling” you spoke of creep up from time to time. I will be anxious to read a bit more. I can read a good book on Classical Christian Education and be convinced that it’s the way to go and then read a CM book and the curious, creative, mom-who-wants-to-enjoy-peaceful-days-at-home-with-her-children-learning-through-life in me thinks CM is worth closer look. I think maybe I am just a combo HSer!!??? 😉 Do you ever have lessons that are discussions? I think lots of narration must foster independent, life long-learning– and attentiveness! Thanks for your post! I can identify with you when you say you can go back and forth about which method to use based on what you’ve read last. I still second guess myself at times when I hear someone else rave about another curriculum. But after having tried CM style homeschooling, I find that nothing else “satisifies.” That being said, I don’t think CM and Classical are totally different all the way through. One common thread is reading classic literature. And I know “The Well Trained Mind” advocates copywork, dictation, and narration. I would say one of the main differences is the approach to memorization. The CM method leans heavily on engaging the chid’s interest in order for him to grasp a concept, rather than on rote memorization (math facts are an exception), reserving memory work for poetry and scripture, things that feed the mind in the process of memorization. All that to say I think it’s very possible to combine the two methods. That’s what My Father’s World curriculum advertises itself as doing. I used that my first year of homeschooling, and actually liked it. But then I found Ambleside Online . . . ! 😉 You can check out MFW curriculum here. http://www.mfwbooks.com/ Enjoy your summer read! I absolutely love The Charlotte Mason Companion, such an excellent book! We aren’t really formal in our narration but we use it a lot in our history and science notebooks, through art and writing. I will also have the little non- writers orally narrate and write down exactly what they say into their note books. It is amazing the things that they pick up. Welcome! So Glad You Stopped By. I'm Rachel, grateful to be . . . . a child of God, wife to a farmer (also my high school sweetheart & best friend), and mother to five energetic and creative youngsters. I live on a farm in the beautiful Shenandoah Valley of Virginia, educate our children at home, and enjoy all things homemaking. 'Tis the Season for Strawberry Shortcake! Our Three Favorite Bar-Cookie Recipes, Featuring......the Best Brownies Ever! Please note: the Amazon links included in my posts are affiliate links, which means I will receive a small commission if you purchase a product after clicking through from my site. If you choose to buy through these links, thank you for your support.